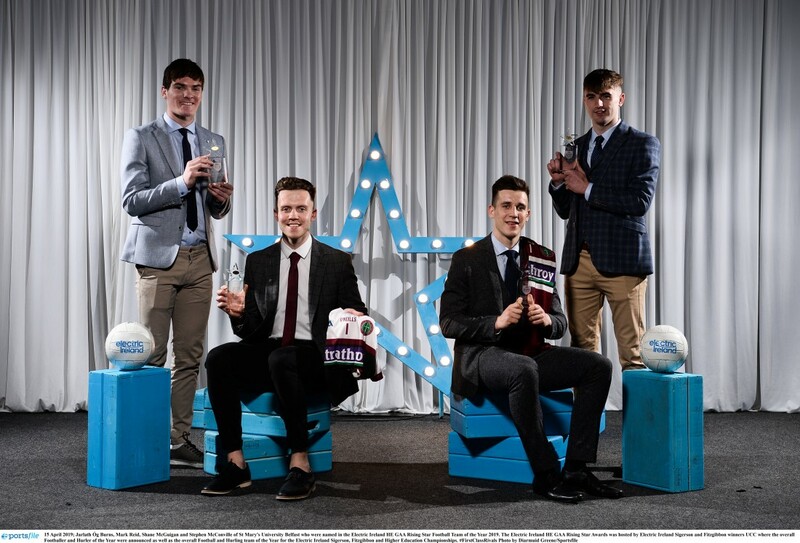 Four St. Mary’s players are named in the Electric Ireland HE GAA Rising Star Awards, Football Team of the Year for 2019. These awards acknowledge outstanding performances in the battle for the third level football and hurling championships and come at the end of what was another fantastic season for St. Mary’s and third level GAA action. Following St. Mary’s remarkable run to yet another Sigerson Cup decider, the four players rewarded with a place on the Team of the Year are; goalkeeper Mark Reid (Down), midfielder Jarlath Óg Burns (Armagh), corner forward Stephen McConville (Down) and filling the other corner, Shane McGuigan (Derry). The breadth of county ties in the Team of the Year show how successful the best teams were in putting to one side their county rivalries for the sake of their college and each of the players selected for St.Mary’s were integral to their Sigerson cup run. Bryansford’s Mark Reid had opposing teams throughout the competition struggling to keep up with his dynamic and varied kicking patterns which consistently found his man in the right position of the field and, when needed in the semi-final, he was also at hand to make a match-winning save. Jarlath Óg Burns has been the engine in the middle of the St.Mary’s team this year and his athletic ability is difficult for almost all who face him directly. Not only able to field the ball above his opposing number, his pace is uncommon in the middle of the park and made him time and again, the difference maker in close ties throughout this year’s competition. Stephen McConville was St. Mary’s talisman in 2019. Roaming regularly in the half forward line, he proved elusive throughout the campaign and was often the connecting link between a rugged St. Mary’s defence and a potent attacking line scoring and setting up points at ease. One player who benefitted from Stephen’s forward play was Shane McGuigan. From the first game against NUIG to the last against UCC Shane McGuigan was the most prolific scorer in the competition. Despite sometimes being double-marked he was accurate from tight positions and ruthless when taking goal chances. Shane was the point at the top of the spear for St.Mary’s and, alongside his three teammates, was a fitting selection for the Electric Ireland HE GAA Rising Star Awards, Football Team of the Year for 2019.